That is "April Showers" of events and happenings overflowed at our meeting this past Saturday, April 15th and it's only the middle of the month!!!! Breathtaking surroundings and trails to unwind. Warm tasty meals and cozy beds to seek. Inspiration exploded as we sewed side by side. And came for a visit at regular times! Exciting discoveries completed our tale. We hope more of you will join as partakers. 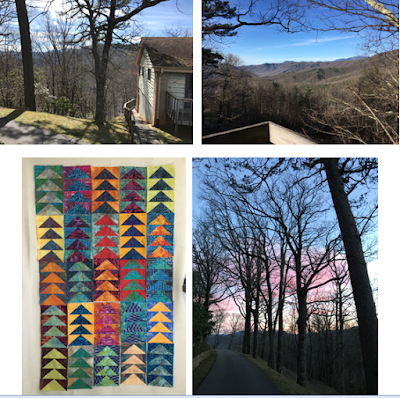 Bottom left: A quilt started at the retreat.....Can you guess where their inspiration came from? Bravo to Faye Jones and Sandy Helsel for planning out all the details of this event so that it could be enjoyed. And, did you read in the poem.....The dynamic duo are already hinting about a retreat next year!!!! 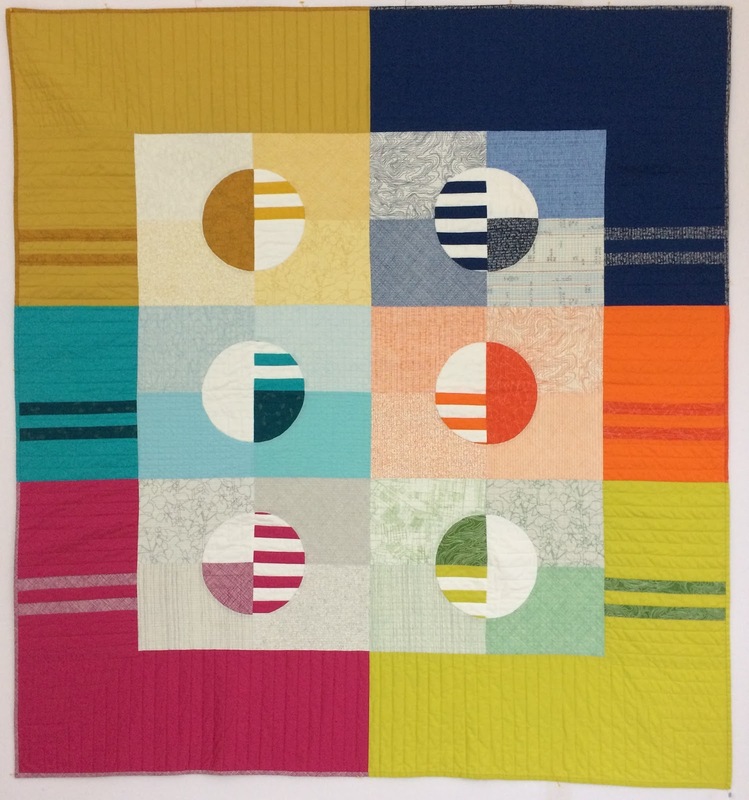 The topic of our April Program brought to light not the black and white of how to copyright an original quilt design, but rather, focused on the many gray areas of copyright infringement. Cindy Lammon and Faye Jones provided us with some excellent research on the topic and then challenged us to a quiz. Cindy separated us into three small groups to better discuss the quiz questions and determine what we thought was the right answer. As the quiz revealed, a lot of these situations are not black and white, but gray because more than one answer to many of the questions seemed right. This month was the unveiling of the quilt projects made with our tucked away, hidden, unfinished quilt squares that someone else selected to take and reimagine anew. As you know, Faye's theory and challenge to us was a hidden away quilt square could be the inspiration to another. Our goal was to prove her right. Our guest judge was Ms. Melinda Hoffman who is a contemporary artist in the Greenville, SC area. Melinda's three joys are printmaking,working with paper and oil painting. The Melinda Hoffman website showcases her work. Thank you Melinda for coming and participating in this fun challenge for our group. Well, do you think we proved Faye Jones right!!! I think so. These nine ladies are the proof. Our challenge winners received a personal handmade bag by Faye Jones. Congratulations! We had a good turnout to our meeting Saturday, April 15th (for a holiday weekend). Paige Alexander reported a total of 30 in attendance. We had 28 members and 2 guests amongst us. Thank you all for coming and participating. Congratulations to the Door prizes recipients. We had four (4) lucky winners to win beautiful two multi-colored finishing thread sets and two quilting magazines. And, many thanks to the ladies who donated the prizes. Did you know - MQG has quilting episodes called "Fresh Quilting" available on online. Check it out! 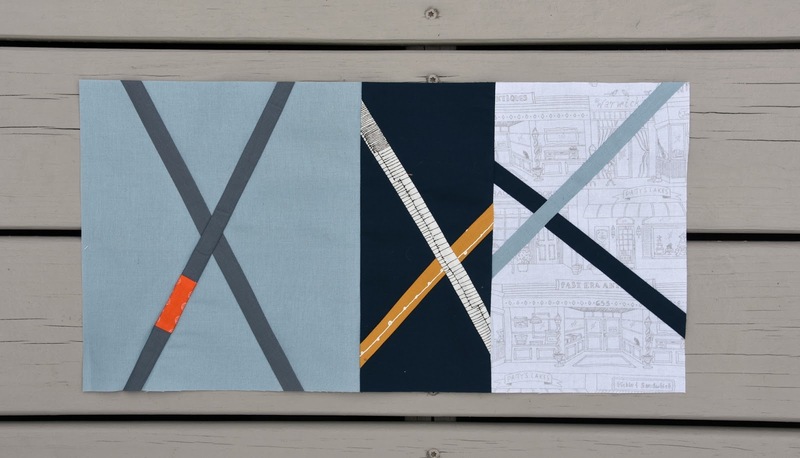 Our March Block Challenge was entitled "X Marks the Improv" with the tutorial on the A Quilter's Table by Debbie Jeske. Look at what we received on Saturday.....what visual energy. Good job. Fabrics/Colors: White background and brightly colored print strips, all colors. Variation on the Tutorial: In Step 6 of the tutorial, instead of aligning the drawn line on the white background fabric so that it is parallel to the seam lines of the strip block, align it perpendicular to the seam lines. As Karen suggests, Cheryl recommends starting with muslin of about 8 3/4" to 9" square. Each set of one strip unit and one background unit will yield 2 blocks. Last month, Faye Jones along with Cindy Lammon and Dana Blasi had opportunity to deliver GMQG charity quilts to the Julie Valentine Center. They were also given a tour of the facilities where the staff shared how much comfort the quilts bring to children when they are being examined. Follow this link to learn more about the Julie Valentine Center. We are making a difference. Faye also shared she has ordered and received GMQG labels that can be sewed on your donated quilt. They will be available to members at our monthly meetings. This is a great personal added touch. In addition, if you would like to be a part of the quilt deliveries to the Julie Valentine Center, please contact Faye birdie1345@aol.com. Visual delight is how I would describe this month's Show & Share. Sometimes a photo does not do the quilt's justice. 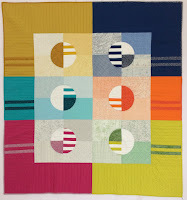 The fabric colors, design and the quilting were really exciting on each of the these pieces. Thank you. 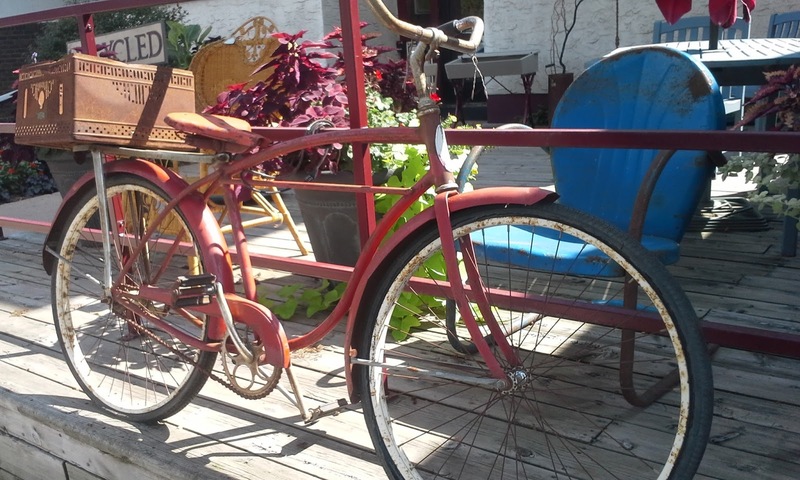 See what I mean.....we had an "April Shower" of events and happenings so far this month and there is still more going on and into May. Lots to inspire....Enjoy!